The art and science of animated trial graphics has evolved dramatically over the past 10 years. Animation used to refer only to 3-D animations that were produced with programs such as Autodesk Maya or Autodesk 3ds Max, formerly 3D Studio MAX. Now a much broader array of animation tools is available to the courtroom animator, and each one has its own niche and its own strong points. We are able to provide animations of all of these varieties in-house, and we work with our clients to select the one that is best in terms of persuasive power, applicability to the problem at hand, and cost. We have done this since 1995. PowerPoint Animation has become by far the most widely used type of animation today. Only 5 percent or so of all courtroom animation 10 years ago, it now amounts to as much as 90 percent today. 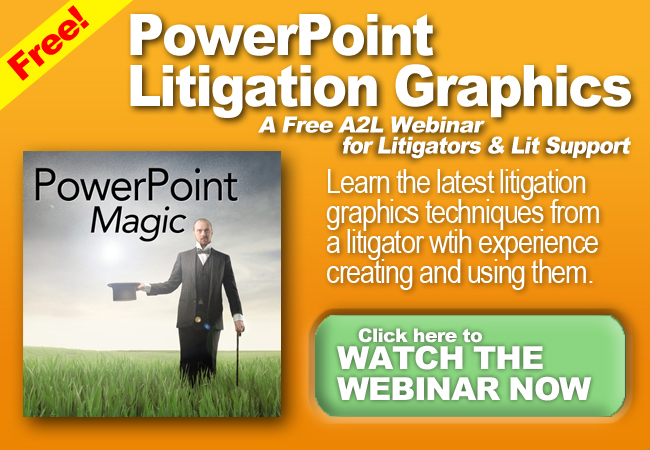 It is a flexible tool that is adaptable to many types of cases and many types of illustrations. For example, this PowerPoint demonstrative illustrates how airbags are designed to deploy in a frontal collision, a side collision, and an oblique collision. This brief animation uses high-quality technical illustration along with PowerPoint to illuminate the airbag technology for a patent infringement case. Two-dimensional animation, produced in a program like Adobe After Effects, can also be a very useful tool. It is quite inexpensive and has an immediate appeal to jurors. In one case, for example, we provided a brief, sequential 2-D illustration of how the copper mining process works, from the raw ore to the finished product. When budget is at issue, this type of animation is ideal for describing complicated information to jurors. Three-dimensional animation is particularly useful when small details, rather than broad outlines, are at issue. For example, in a patent trial where the workings of a toner bottle were at issue, we produced a graphic that showed the toner bottle in all three dimensions, so that the jurors could understand the unique technology that permits the toner to move through the grooves of the bottle. Here, a two-dimensional representation would not have been adequate to show how all the parts of the bottle work together. We also used close-up views to show precise details. Finally, we have used Flash animation to present long-form tutorial videos. Often, these are intended for judges rather than for juries. For example, we often use Flash to build patent tutorial videos that explain the background of the technology at issue in major patent litigation. Since a great deal of patent litigation occurs in the Eastern District of Texas, we have created many 30-minute tutorials for judges there that combine audio and video. One good example is a demonstration that we provided of the workings of a “picking machine” in a hospital that uses both information technology and mechanical technology to translate a physician’s prescription orders to the actual selection by mechanical means of a medicine from an array of drugs. With animated trial exhibits finding their way into most cases with at least millions of dollars at stake, the modern litigator must be aware of the four courtroom animation options. Fluency in this language of animation will result in savings of time and money. Environmental Litigation Trial Presentation & Trial Prep E-Book 2nd Ed.